I’m at it again. The discovery of “BlogSpot” has motivated me into writing more. Although I usually reserved the homepage of Horsetrailriders.com for my “Stable Talk”, this blog affords me an easy format that I can update from any computer while still giving you links to your favorite Horsetrailriders.com pages. I’m working to integrate it as my home page without having to link over – but even after all these years, I’m just a small town amateur web person, trying to make things work! When I started riding – more specifically, trail riding, there was no ‘one source’ listing available indicating trails in our state. So I set out to list them. Short of naming all the small lakes and wildlife management areas which don’t necessary advertise for horse traffic, but allows us to ride, I think I have accomplished listing the Horse Trails in Nebraska which are the most popular. And I have been fortunate enough to ride many of them. In time, would like to expand upon the brief descriptions, perhaps add more pictures and trail maps, if available. The Classifieds is still the most read page on Horsetrailriders.com. However, the recent popularity of Craig’s List and the speed to publish that CL affords its customers has reduced the number of ads coming my way. Everything is manual in my world and when you work with Ol’ Manual, the process can be slowwww. I’ll continue to monitor the value my Classifieds provides and make decisions about its future next year. When I first started riding, I would hear about rides AFTER the fact. There were no “calendar of horse events” that was readily available. I think today Horsetrailriders.com captures those Trail Rides & Horse Events most geared toward Nebraska trail riders and then some. 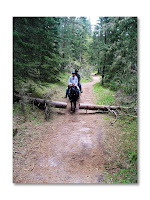 I saw Horsetrailriders.com as a place for private ranches, businesses and facilities to advertise as well. That part hasn’t taken off as much as I would have liked, but I haven’t really promoted it. Perhaps that will be the next phase to this website. Horsetrailriders.com is now, undoubtedly, the source for horse trails and horse trail rides in our state. That part of my mission was accomplished. What Horsetrailriders.com has given me is a community of horse people I wouldn’t have found without it. What has it given you? Are there things you would like to see improved or expanded on Horsetrailriders.com? You can reply by selecting “comments” below. It’s always good to hear from readers. Wow! Beautiful photos! Love the snow with the horse! You can put pictures of ME on your site!!!!!!! You can use that one where you think your thigh is giant!